WASHINGTON, DC, February 27, 2014 (ENS) – The governments of Alberta and Canada have been “lying,” to cover up the health impacts of the Canadian tar sands industry on northern Alberta communities, a Canadian medical doctor told U.S. senators at a news conference Wednesday on Capitol Hill. 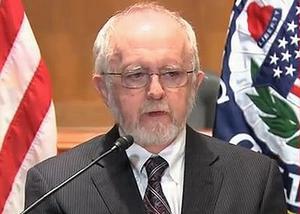 Dr. O’Connor was invited to brief two U.S. Senators on the health effects of extracting, refining, transporting and burning the world’s largest deposits of bitumen, or extremely heavy crude oil, located in northeastern Alberta. Senator Barbara Boxer, a California Democrat who chairs the Senate Committee on Environment and Public Works, and Senator Sheldon Whitehouse, a Rhode Island Democrat who serves on the committee, invited Dr. O’Connor to Washington to brief them on his experiences. Saying the health impacts of tar sands oil are being ignored, the two senators Wednesday called on Secretary of State John Kerry and the Obama Administration to conduct “an immediate and comprehensive study” of the public health risks to communities from the proposed Keystone XL pipeline that would carry diluted bitumen from Alberta, across the U.S.-Canada border to refineries on the Texas Gulf Coast. “Health miseries follow tar sands – from extraction to transport to refining to waste disposal,” Senator Boxer told reporters at the news conference. O’Connor said he came to Washington “with absolutely no political agenda” but felt he had to act as an “advocate for patients” because his frequent calls for Canadian authorities to take precautionary measures of safeguard the health of northern Alberta communities have been ignored. “In my experience, when pressure is exerted outside Canada, the government reacts,” said O’Connor at the Washington news conference. The Alberta physician cited statistics for rare cancers that are now 400 times more frequent than would be expected in the tiny community of Fort Chipewyan, which lies just north of the oil sands. O’Connor pointed to the case of Fort Chipewyan Councillor John Chadi who fell ill last fall just 48 hours after being sworn into office. He was diagnosed with rare, incurable bile duct cancer, also found in other people living nearby. But he told the news conference of a December 2013 study by scientists from the University of Michigan and UC Irvine showing that rates of leukemia and non-Hodgkin’s lymphoma have soared since 2004, particularly among men who live downwind of emissions from the tar sands operations. One of those scientists, Dr. Stuart Batterman, professor of environmental health sciences at the U. Michigan School of Public Health, was also at Wednesday’s news conference. “We need to be proactive and avoid this situation in the first place,” Batterman said. He said the problem should be solved before cancer develops, not relying on damage control after the disease has appeared. Hilton Kelley, a community representative from Port Arthur, told the news conference that his city is already on the U.S. EPA’s list of cities with dangerous ozone levels, and its residents suffer from asthma, respiratory ailments, skin irritations, and cancer. Tar sands will add another threat to Port Arthur and other communities that are already in distress. “To get to the Gulf Coast, tar sands will be transported by pipeline through communities in environmentally sensitive areas in six states. We know from experience how harmful this can be, because tar sands oil is very difficult to clean up when a spill occurs,” said Boxer. “In neighborhoods in Detroit and Chicago, massive open piles of tar sands waste byproduct, known as “pet coke,” have resulted in billowing black clouds containing concentrated heavy metals. Children playing baseball have been forced off the field to seek cover from the clouds of black dust that pelted homes and cars,” the senators wrote. First proposed by the Alberta company TransCanada in 2008, Keystone XL requires a Presidential Permit because the pipeline would cross the U.S.-Canada border into Montana. The State Department is responsible for reviewing applications for cross-border oil pipelines, deciding whether the pipeline would serve the U.S. national interest and making a recommendation to the President, who makes the final decision. The Keystone XL pipeline is now in the National Interest Determination/Final Decision phase after years of environmental impact reviews and challenges to those reviews.